You will never find this curry on the menu anywhere in India. This is Indo-Continental version. Curries are made using curry powder to give an Indian touch in the western countries. I was reluctant to taste it thinking it will have a sweetish taste because of the apples added to it. But believe me, it was really tasty. Here is the recipe. This curry is mild with no chillies. I have given the original version. You may add chillies and make some variations if you wish to..
Coriander powder .... 1 tsp. Cumin powder ... ..... 1 tsp. Curry powder .......... 1 tbsp. Yogurt or sour cream ... 3 tbsp. 1. Heat 1 tbsp. oil in a pan. Stir fry the chicken until half done. Remove and set it aside. 2. Add the remaining oil and saute the onions until golden. 3. Add the ginger, garlic and the spice powders. Stir fry for a minute. 4. Now add the tomatoes and apples. Cook for 2-3 minutes. 5. Add the chicken and the stock ( or water). Taste for salt. Simmer and cook until done. 6. Stir in the yogurt or sour cream. Thanks Shobha for the warm welcome :)I wish I had the opportunity to get in touch with you while I was in Pune,but time flew by and every day was packed. Hopefully we will see each other on my next trip to India. BTW this apple chicken recipe sounds so unique,and I can understand your reluctance too for the first time,but honestly this preparation has already inspired me and I need to prepare this soon.Keep it up !!! Thank you so much for your appreciative words on my posts.. wish we had met up on this trip. Hopefully one day we will. Chicken and apples! that is an interesting combo!! Yes, even I tried it out for the first time. Yes Vimitha.. do let me know if you liked it. An apple curry sounds fantastic! An apple in a curry? wow! this is amazing! I never could have thought of that. You really do magic in your kitchen Shobha. Have a great week! Different & innovative recipe..will try it soon. 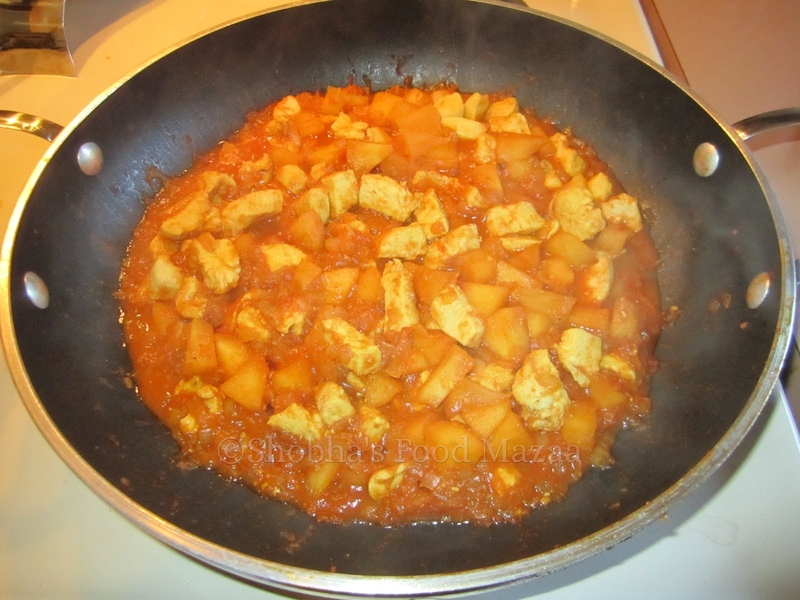 Wow...I have always loved the mix of sweet and salty flavours...And this apple and chicken curry looks like a wonderful combo...Sure to give it a try..
You must Neha .. if you like the sweet and salty flavours you will love it. This is really a great idea...shud have tasted great..
its a very new thng...Chicken and apples! that is an interesting combo...looks gr8..